Alison Bechdel grew up in a small Pennsylvania town, where her father worked part-time at the family funeral home business. Her parents had married in Germany, but by the time Alison is old enough to understand family dynamics, she realizes that her family members isolate themselves from each other, that they don't interact the way other families do. Her parents fight a lot, when they actually talk to each other. Her father loves gardening and decorating, and her mother acts in local productions and is working on a huge thesis statement. When Alison goes to college and realizes she's a lesbian, she comes out to her parents and only after that does she realize that her father also is gay. This graphic novel is Bechdel's attempt to reconcile her childhood memories with her new knowledge of her father and their relationship. My first graphic novel experience was a prequel to George R. R. Martin's Song of Ice and Fire series. I still have it on my shelf. I didn't much like it, and I never tried to read another graphic novel. The closest I ever got was The Invention of Hugo Cabret, which is a YA novel that has a lot of important pictures in it. But Nymeth reviews graphic novels quite often on her blog, and they always look so pretty. And it just seems like a really interesting and novel approach to telling a story. So with a little nudging from Nymeth and some help from a co-worker, I decided to try another. My co-worker lent me Fun Home last week, saying that if one wants to really give graphic novels a chance, it's better to start with the memoirs than the fantasy ones. And, as I enjoyed Fun Home, I'd have to agree with her. I don't really know how to review a graphic novel. Focus on the words? On the pictures? I don't have much to say about the pictures. They add to the story, yes, and I enjoyed looking at them, but I can't say much about how Bechdel's artistry compares to other graphic novelists. When I first started reading, I'd look at the panels for some time before reading the associated text. But as I got further into the story, I switched- read the text first and then looked at the pictures. I'm not sure which way is better, or if there is a right or wrong way. I did feel as though it required much more concentration on my part to read this graphic novel than if I were just reading a book with only text, because I kept feeling like I'd miss something in the pictures if I didn't look closely enough. Hopefully I didn't! What I liked most about this book was the author's way of referring to so many other books. Bechdel obviously knows her classics, and I loved the way she set up parallels between her life and the works of Collette, James Joyce, Oscar Wilde and Odysseus. It was done so well, and while this book put off my reading of Joyce's Ulysses indefinitely, I really enjoyed all the allusions to so many books. I also thought that Alison's portrayal of her parents was done well. Both of them develop into very strong characters in the novel, and it's obvious that their lives took a turn they didn't expect when they moved back to Pennsylvania and had a family. I often wonder what my parents would have done with their lives if they didn't have children. I think they would have spent a lot more time jet-setting around the world. It's always a jarring moment, I think, when children realize that their parents could have led very different lives if their kids just hadn't shown up. In contrast, I don't think Alison developed the characters of her brothers much at all. I don't know if this was done on purpose, but I assume it was. But I found it really sad, considering how close my relationship with my siblings is. I think Fun House was a really good introduction to graphic novels for me. I don't think I fell in love with the genre through it, but I'm definitely willing to try out some more. I'm glad I tried this one, and if anyone else hasn't really tried graphic novels and wants to give them a try, I think this is a good first foray into them. I agree that this is a good one to start with to ease oneself into the genre. I hadn't realised until now that the three graphic novels that I have read have all been memoirs: Persepolis, Fun Home and Mau; how odd! I loved the literary allusions in this one. I also think that Bechdel may have had a difficult time writing about her family and perhaps focused on her parents more than her brothers because her brothers are still alive? She wasn't just writing her story but theirs and it is difficult subject matter. Graphic novels are a bit of a new concept for me. I love the reviews that Nymeth writes, but I never seem to find these graphic books widely available. Blodeuedd- This was pretty much my first graphic novel, too. I decided to give the genre a try and it wasn't actually too difficult to read. Paperback Reader- I loved the allusions, too! So interesting. Your point about her brothers is a good one- though isn't her mother still alive, too? Vivienne- I have the same issue! I borrowed this one from a friend. She is going to be my go-to person for GNs, I think! I had the opportunity to read this last year and enjoyed it. I am never quite sure how to review graphic novels either. I try and focus on the characters and the story mostly--it's safer ground for me; although I do try and mention the art, even if only minorly. I'm glad you enjoyed it- it's kind of a dark story so it's not one of those happy fun books but I hope you can find more in the genre that you like. :-) Reviewing them takes some getting used to- I try to do a graphic novel review every week just to practice but sometimes I'm at a loss. The book UNDERSTANDING COMICS is really good for introducing you to the technical aspects and aspects of criticism as well. Aarti, I think her mother is still alive but she was integral to the story whether her brothers strictly weren't. 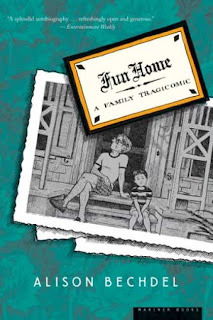 Fun Home was my first graphic novel too. I loved it and have since go on to enjoy several more. I hope that you find more graphic novels to enjoy. Fun Home looks like an interesting read. I'm never too sure how to review a graphic novel, either. I have never paid much attention to what I was focusing on as I read, the pictures or the text? I will definitely have to keep that in mind for my next one. I loved all the literary references too! 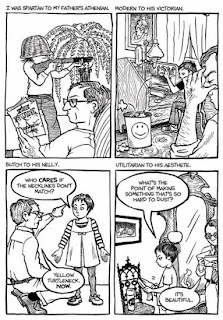 :) I really like Bechdel's drawing style, but I think that's because until I read Fun Home, I'd only read a couple comic book-style graphic novels. So it was relieving to have such a different kind of artwork. I second Marie's recommendation of Understanding Comics - it's an amazingly informative and fun book! One of the main points it makes is that comics and graphic novels are really not a genre at all, but a medium - they encompass every genre, from fantasy, sci-fi and horror to journalist, science, memoirs, etc. And so there's something out there for fans of all those genres! I think the trouble you had figuring out what to read first goes away with time. I wanted to share an awesome article on comics literacy from the First Seconds blog that touches on this. First Second, btw, are my favourite comics publisher - I loved everything of theirs I've read so far. I think reviewing GNs also gets easier with time. For example, I no longer ask myself whether I should focus on the art or on the text because I don't think of them as separate anymore! I hope this makes sense. Wendy- I will look out for more graphic novels on your blog as I always feel that you review such a fabulous variety of books that I would enjoy! Marie- You're so right. It's definitely a dark story but at the same time, I feel like the author has a lot of positive memories of her father, too. My relationship with my father is not nearly so complicated, but I can't even imagine what writing a book about him would be like. It's such an emotional relationship. Claire- You're right- I think her mom is alive. And I can see why she did the cut-off at her brothers, but at the same time I thought it made the siblings seem really cut off from each other. Belle- I think you'd like it. Definitely different from what I think French Milk is, but really good for book lovers. Eva- Yes, I think you're so right! I will sound horrible saying this, but I didn't expect the graphic novel to be so literary and symbolism-based. It's a reader's graphic novel, and it was really great for that reason. Nymeth- I am not sure if I'll read Understanding Comics only because I don't like "How to Do X" books, that describe how to do something. It's true people should be active readers but at the same time, I don't like people telling me how I should do my hobby. Hopefully if I just get more used to graphic novels, I'll start to understand them better (of course, I can also always look at your reviews!). For example, I no longer ask myself whether I should focus on the art or on the text because I don't think of them as separate anymore! I hope this makes sense. I've just had a paranoid moment. I didn't like this book as much as other graphic novels I have read this year, but it still looks good. My sister reads graphic novels and have tried and failed to get me on board. I see the talent and devotion given to the text BUT I can't seem to focus enough to get into them. Your review was well written and fair as ususal. I alwasys get how much you care about the authors and their work. I respect it about you. Hey, this just happened to be the first graphic novel I read, too! I quite enjoyed it and have gone on to read several more from that genre. One of my favorites and one that I continually recommend to those new to graphic novels is Persepolis. you got a very noce blog and good reviews. Adding you on my blogroll. "Fun Home" is genius, one of my absolute favorites. Another great graphic novel to ease one into the genre: "Ghost World." No superheroes, no monsters, but a tart and penetrating look at adolescent female friendship. The movie was OK but didn't do it justice. Mark- Thanks for the link! I checked out Cornell's blog and enjoyed it. Will keep it in mind in future when I look for new graphic novels to read. Kelly- I remember you telling me you didn't like it as much. I really can't compare it to much myself, as I haven't read any other GNs. But I am reading Blankets with Ana next so I'll rank it after that! Simone- Thank you so much for the compliment! I really have never been into graphic novels, either. This is a new foray for me. I sometimes feel I am too heavy-handed with the fantasy and historical fiction, so it's nice to see what's going on in other types of fiction. Sumanan- Thanks! Glad I discovered your blog via Virtual Advent. James- I now have "Ghost World" on my wishlist. Much appreciated! Anything else you suggest? I have Blankets on my shelf, borrowed from a co-worker to read next. It is massive, but I am assured it is excellent.